Now to be fair, I'm not yet at the end of my third pregnancy, so time will tell, however, all the usual indicators are there. The ones that point towards another gigantic offspring growing in my ever-stretching uterus. The growth scans are on par with the OB's best guess, and the fundal height is off the charts... as per usual. Up until this point though, everything was smooth sailing, and we had a plan. Together with my OB, we were confident that it could still be done, we would work on an early induction. Hoping to ensure a slightly smaller baby, and a somewhat natural delivery (just to clarify, my second was born suffering mild shoulder dystocia at only 39 weeks gestation). Except suddenly, all of that changed. Suddenly the 'C' word was being thrown around... Suddenly I was being faced with the prospect of a Cesarean delivery. 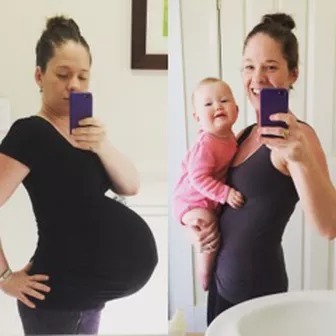 The Mumma's that have the drug-free water births should be able to birth without fear of sounding smug to others for their achievement. The Mumma's that don't want to feel a thing, and opt for that blissful epidural, I salute you (and totally feel your pain... or lack there of), you should be able to enjoy that pain free labour. To the Cesarean Mumma's that may have given up a dream of that empowering drug free birth because things didn't quite go to plan, you're so much braver than you're given credit for... and I praise you.